The bespoke pea coat had many inspirations. Among its foremost influences were the personal creations of Davide (Taub, Gieves & Hawkes head cutter); the Gieves military and naval archive; and the embroidery designs of lovely Claire (Barrett) at Hawthorne & Heaney. All three came together in the details shown here. We had our second fitting on the coat last week – having missed the last Winter by some margin, the project had been taken up again last month, to have it ready for October. The fit of the big, structured coat over a suit is wonderful, but I’ll post more on that at another stage. For the moment, here are the details. Above, the quilting in the chest of the jacket. Quilting doesn’t necessarily require any filling, as a reader questioned in the first instalment. 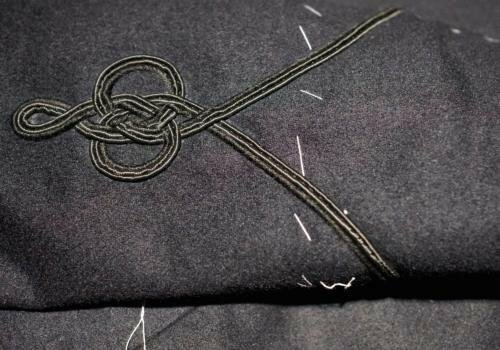 Rather, it is the sewing of regular lines in order to create greater structure in a chest, without any more canvas or other lining. The pattern worked by the Gieves tailors here is a sunburst, radiating from the armhole. Under the new creative management Gieves is finally making all its bespoke in-house (no outworkers) creating a greater cohesion and stronger direction. It’s something Davide has always wanted, and it’s great to see it in action. 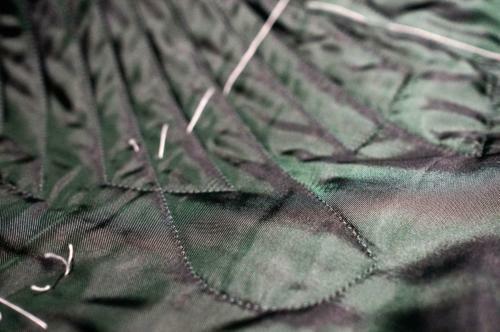 Next, the embroidery. Davide and I went through the Gieves archive looking for examples of designs we liked on the cuffs and backs of naval coats. There was a lot, and most of it far more intricate than the designs here. Frogging like this was nearly always used to finish off the cuffs of jackets, creating decoration and hiding the transition from cuff to sleeve. It would usually reflect work elsewhere, such as on the cuff, epaulettes or back. In the end we picked two simple designs that we liked – one for the cuff (below) and one for the back of the neck (above). By rendering them in black the effect is much more subtle than any of this coat’s naval antecedents, but also more modern. 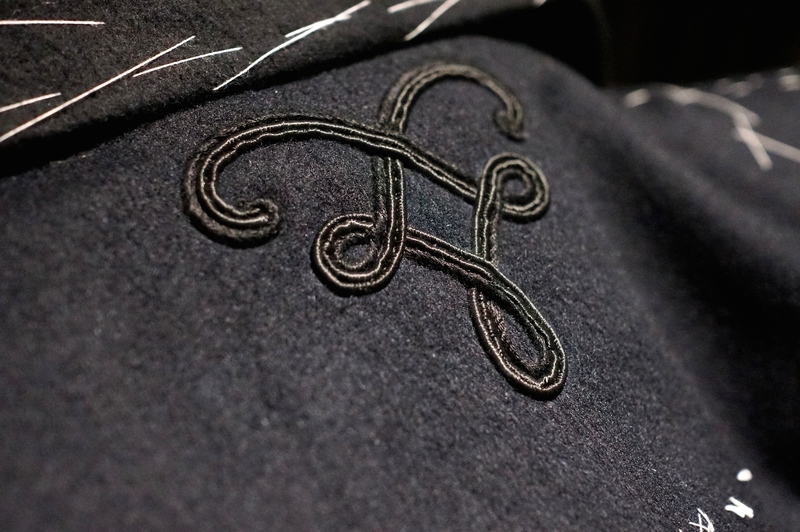 The frogging is made up of Russia braid (the two shiny lines) and an additional line of black silk. The latter was added to increase the contrast in texture between the lines as well as against the coat itself. Actually, it’s wrong to say we picked the designs. We gave Claire some rough ideas and pictures, and she came up with the designs herself based on Austrian knots. She deserves the lion’s share of the credit. Hawthorne & Heaney now has new digs, by the way, sharing with Dugdale’s on Mill Street at the top of Savile Row. Claire is therefore around the area far more than she was (the workshop is up in Islington) and can take appointments for anyone that wants to discuss work on a bespoke item. As a guide, this work on my coat cost £210 and the beautiful gold leaves Claire did on my velvet jacket cost £93 (both inc. VAT). 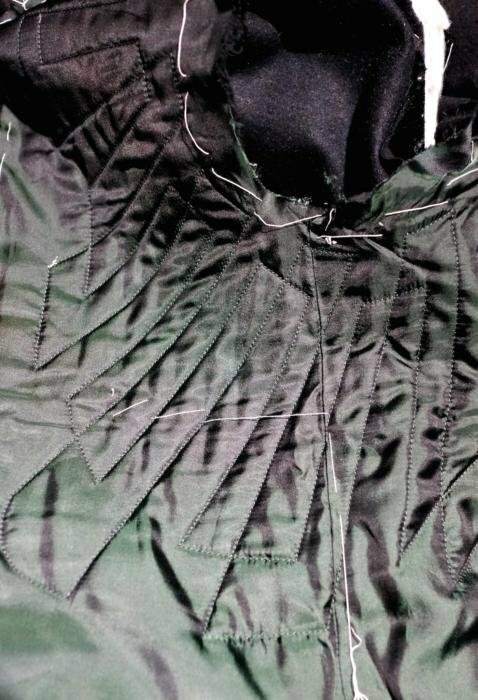 You can see some pictures of the coat in its current state on Davide’s blog. You can follow the discussion on The bespoke pea coat – Part 3 by entering your email address in the box below. You will then receive an email every time a new comment is added. These will also contain a link to a page where you can stop the alerts, and remove all of your related data from the site. The link to Davide’s blog actally take one to Kirby Alison’s site. I guess that’s not what you intended? I read on your ‘Contact us’ page that sartorial questions should be posted as a comment on any post, so I hope it’s OK that I chose the top one. I am traveling from Norway to London in August, from the 22nd to the 24th. My hope is to find a good quality RTW dinner suit. I have a good body shape for RTW, as I am 190cm, 84 kg, and have quite broad shoulders. I do however, like to have the jacket taken in a bit, for a closer fit. I am a diligent reader of your site and I know that you do not like to recommend tailors/shops that you have not tried personally. My question, therefore, is if it would be possible for you to give me some names that generally are considered to offer good quality RTW dinner jackets/suits . To make it easier for you to come up with some names, my budget is around £700 unless it is something quite special. I guess I can stretch it to around £1000 if you some really good options. This is excluding accessories and shoes, of course. I am a bit unsure of how I think the link-closure button will look. Have you heard of Oliver Brown? Judging by their own descriptions, this seems to be good value for money. What do you think? Again, I am not asking you to personally recommend, but your general knowledge of the London Formal Menswear-scene is one that I will never achieve. So to sum up: Do you know any other shops in the “same street” as Oliver Brown that I should consider on this week-end trip? I am looking forward to your answer, as I am a big fan of this site and your unmatched appreciation of good-quality clothing. Thanks for the question, and pleased someone has read what I can and can’t recommend on RTW! I’ve never heard of Oliver Brown, so can’t comment at all on that I’m afraid, The single link should work well though. I’d try places such as: Ralph Lauren, Hackett, Dunhill, Aquascutum, Gieves & Hawkes. Most things in your price range should be a similar quality, but assess them according to me guidelines in the How to Spend It column on suits. And try and get grosgrain for a DJ rather than satin if you can. Suitsupply is generally recommended for DJ (and suits) in SF circles for good price quality (if you wear same size jacket and trousers). They do frees hipping and returns internationally. Half canvassed. Having read your earlier posts on this Peacoat ,and now gone back and looked at David e’s blog, I’m surprised that Davide doesn’t turn this into a RTW. 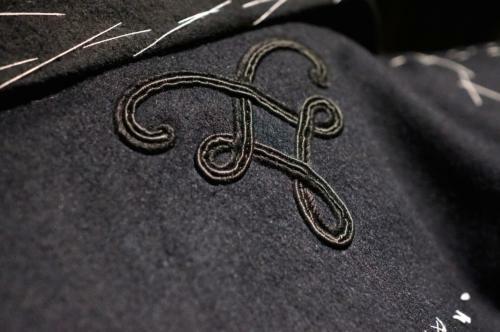 The shape , embroidery, the back of the jacket are truly exceptional. PS should seriously consider marketing something like this as a RTW, particularly for those of us who enthuse of bespoke but have ‘shallower’ pockets. This is going to be something special, I look forward to the finished article and pictures. On the subject of coats esp. overcoats I wondered whether you would consider an article reflecting on the strengths (and otherwise) of overcoat tailoring on the Row. It might be supposed that all are expert but it would be interesting to gain an insight into the subject (who specialises in what, the distictive history that each might bring to the garment, how Italian and French tailors compare). I am interested as it seems that few manufacturers outside of Crombie, Acuascutum and Burberry continue the standard for British overcoat tailoring, accepting of course that this is a request for a later season. I have not had any overcoats made on the Row, so not sure I can add much in this regard, but the traditions around suiting are reflected closely in overcoats – structured at Richard Anderson, drapey at A&S etc. That’s the most significant difference, little around history etc really. The reason history is significant with this Pea Coat is purely that Davide and I took the time to look into the archive for inspiration. That’s easier at Gieves, but you could do pictorial research and bring it to any tailor to help inform the design. how do you plan to combine the pea coat? I could straight away think of a light grey flannel suit. – But would it work with darker suits? – Would it work with more smooth finished suits like light gabardine or light plain weave? Or would you strongly recommend more textured suits under the pea coat? – Would it work with denim? Hi Simon, Is it possible to get a bespoke peacoat for £1000 or less in the UK ? Thanks. How much should i really budget for ? It depends hugely on what you want – the make, the quality. If you’re in this area, I’d suggest Graham Browne is a good place to start. The next step with English makers would put you closer to 3000. Thanks. I’m in north Essex so only around 60 miles from london. Hello again. I’ve just had a reply from Norton and Sons regarding a bespoke peacoat and prices start at £3450 inc vat.